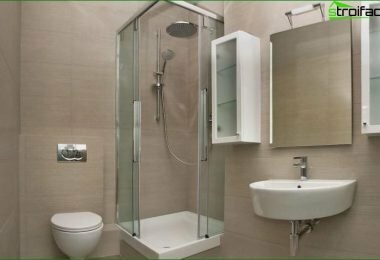 As is known, a bathroom is unlike anyother high humidity, so its equipment requires special attention and it concerns primarily the ceiling. The ceiling in the bathroom suffers from influences from above (leak from careless neighbors), and below - the steam from the hot water, spray shower, "sweating" of the pipe, high humidity. Options abound ceiling devices today, but unfortunately, not all types of finishes and materials can withstand such severe conditions for a long time. Choose a ceiling for the bathroom should be deliberate to make it practical and aesthetic at the same time, he brought no hassle, and combined with the bathroom interior. Let's try together to find convenient options and many interesting answer to the question, how do the ceiling in the bathroom? 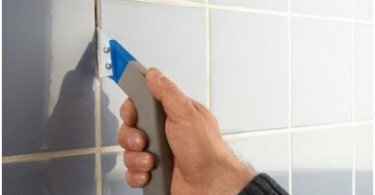 For low-cost solutions include whitewashing, painting, vinyl wallpaper, plastic panels for the ceiling in the bathroom ..
Whitewashing - the least expensive in financial termsold, proven way. Of course, this option is finishing the ceiling is the cheapest, but also the most fragile. Whitewashing is suitable for dry areas - it does not tolerate moisture. Therefore, to maintain the ceiling in good condition will have to make regular repairs. In addition, such a coating for the ceiling in the bathroom will look too simple. This is one of the efficient finishing optionsthe ceiling, but not so easy. 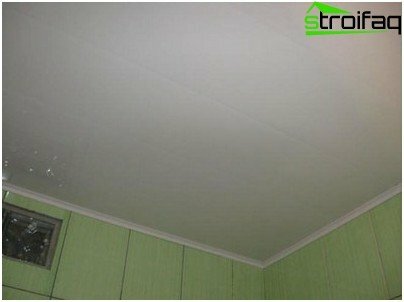 First, the paint can only be perfectly smooth ceiling, which means that you must first remove all irregularities, defects, proshpatlevat, primed, and only then to apply the paint. Secondly, you need to choose the right paint. Use should be high-quality acrylic water-based, designed for bathrooms, only in this case ceiling will last a long time, without creating unnecessary trouble. These paints dry quickly, not afraid of water. Many of them contain special substances which provide protection against mold and mildew. 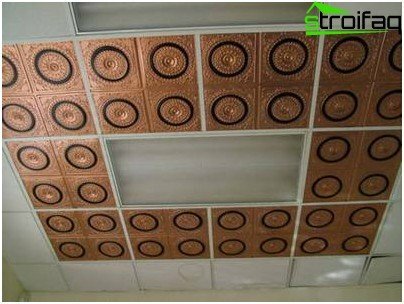 Staining also benefits from an aesthetic point of view, because the ceiling can be painted in any color, decorate it designs and drawings, although today hardly anyone surprised by this process finishes. 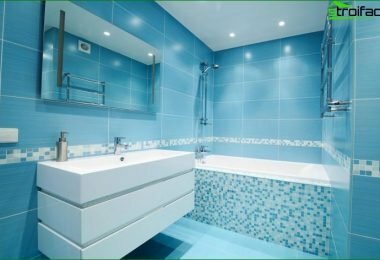 To finish the ceiling in the bathroom can also beuse vinyl wallpaper, which, due to the outer plastic film, are not afraid of moisture and water. 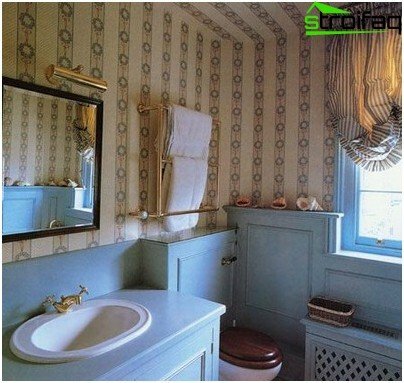 To pokleit vinyl wallpaper, you need to carefully prepare the surface to avoid defects, otherwise the ceiling will look messy and spoil the general view of the bathroom. The joints between the strips must be perfect, because if even one left a small gap, the fungus will spread throughout the ceiling. If necessary, the wallpaper can be repainted several times. Often used for finishing the ceiling in the bathroom panels of chipboard. 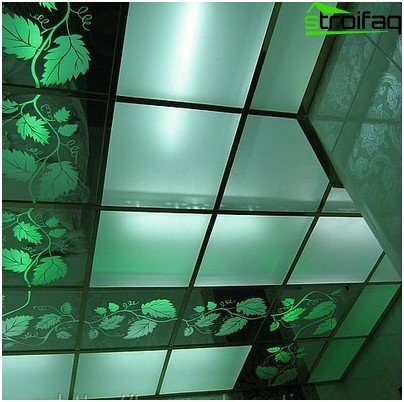 Because tree - hygroscopic material,panel without fail to protect water-resistant lacquers. It is very important that the bath room is well ventilated and ventilated. Under these rules wooden ceiling lasts a long time. This ceiling will look very stylish and will create a warm and cozy atmosphere. Enough popular option finishing the ceiling in the bathroom are plastic panels PVC. Material inexpensive, available in different colors. They are easy to clean and are not afraid of moisture, mounted simply and lowered ceiling by only a few centimeters. It can be embedded in the panel lights. They look very attractive and able to adjust to any design. The main hit today - chameleon panel and mirror panel. 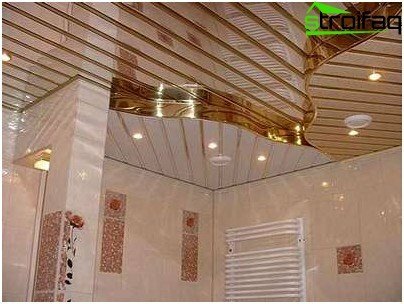 If you are wondering how to make the ceiling inbath, his finish was not only practical, but also beautiful and original, then pay attention to the more expensive fashionable types of ceilings that are becoming increasingly popular with each passing day. These include suspended ceilings, which can be tiled and the rack, metal, glass, mirror and ceilings. A good option for a bathroom can be suspended from the ceiling mineral plates. The main component is a mineral platesclay, which endures high humidity bath. However, you need to choose the hard to buy it moisture-proof plate. Such materials are able to withstand humidity, reaching almost 100%. Even with substantial leakage washable platespractically not be affected. Their size will increase slightly (but only in height), and when the tile is dry, on it completely will not be visible traces of leakage, unless, of course, the water was not rusty. If you prefer fashionable futuristic styles, then it is better to prefer metal tile mineral. Its most important advantage is the strength and the damage it is not so easy. The steel plates do not differ, however, rich color and even moisture condenses on them, which adhere well to contamination, which means that they have to be washed frequently. This problem is also solved by a device of competent system bathroom ventilation. 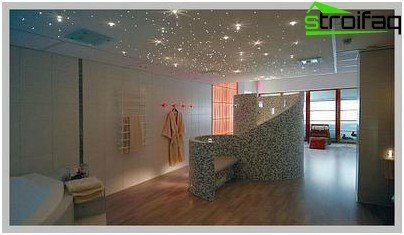 In the bathroom, you can choose as a material for suspended ceiling slabs of drywall. 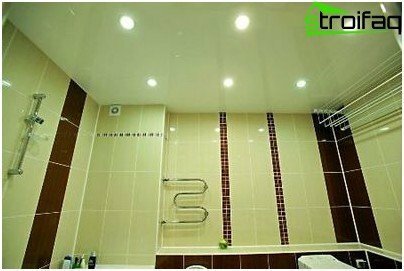 Currently on sale for bathroomsSpecial moisture-proof sheets, which can be hidden under the ceiling bumps, wiring and piping. Such sheets are environmentally friendly and easy to set. They can be adjusted to the exact size without irregularities and joints. When you create a multilevel plasterboard ceiling in the bathroom, use a damp drywall, which bends easily. He give any desired shape, and then it stores it. Care for such ceiling is not difficult. Its just wipe with a cloth or sponge soaked in cleaning solution. suspended ceilings - A kind of popular now suspendedceiling in the bathroom. They are made usually of aluminum or steel, while they have a broad range of colors - 50 tones. They are practical, durable (service life - 15-20 years), non-flammable, environmentally friendly. The most fashionable colors - chrome, gold, mirror. Reiki does not absorb moisture, do not rust, make it possible to draw any ceiling configuration. They are smooth or perforated. Joints suspended ceilings can be made inserts intermediaries. Such a ceiling can be given any shape,using, for example, a wave-like rail. "Eats" it is thus only 3 cm in height. Rack ceiling is lightweight, its installation can be done on their own, without the involvement of a specialist. Caring for them is simple: it can be washed with ordinary detergent. Stretch ceiling - the only type of finish,by which is achieved completely even surface over the entire area. It is made of a special material based on vinyl. This ceiling - quite an expensive option, but high costs are fully justified. 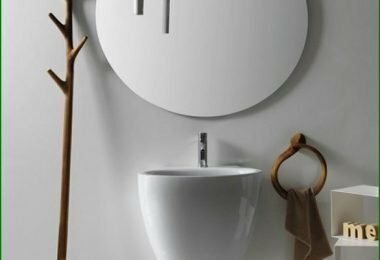 It will give the bathroom a modern, trendy look. 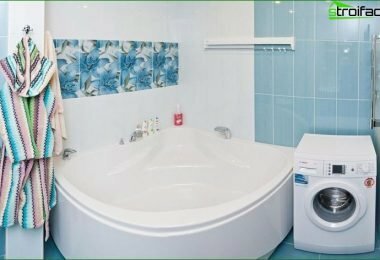 And if you like to spend much time in the bathroom, while the suspended ceiling is perhaps the best choice, because it does not form a mold and is not digested by microorganisms. Furthermore, on the surface of suspended ceilings condensate it does not accumulate. 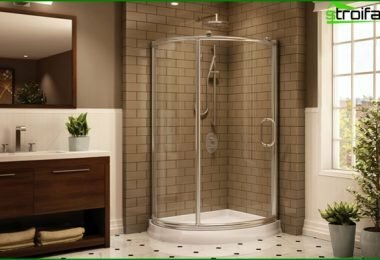 This can be explained by the fact that the web is warming almost instantly to steam temperature in the room and the bathroom so the moisture does not condense. It can withstand high temperatures (up to + 50 ° C) and is not deformed. There is another advantage in suspended ceilings. They are the best defense against negligent neighbors, periodically arrange floods, as can withstand up to 100 liters of water per square meter. In such cases, call the installer who installed the ceiling: they will merge the water and will dry the ceiling, and the service - free. Caring for stretch ceilings - minimum: occasionally wipe with a cloth and all. The richness and variety of textures and colors tensionceilings has no equal, and it allows you to choose the most balanced option. If you need to increase the visual space in the bathroom, you should pay attention to the glossy ceiling. That glossy ceiling is the most popular today among designers. Satin and matte paintings resemble outwardly standard finish - whitewashed ceilingWith the difference that the surface is perfectly flat. Often used combined glossy and matte surfaces. Very popular in bathroom ceilingswith photo printing, admired exclusive options ceilings "Starry sky". Taking a bath, can be well relax and get away from the worries by watching the amazing effect of twinkling stars. For suspended ceilings are very important to the quality of the installation, so make a ceiling in the bathroom with their hands is unlikely, definitely need to invite experts. 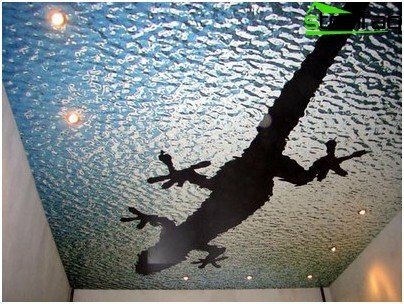 For bathroom mirrored ceiling - a very goodoption ceiling coverings. With the bathroom ceiling is not only attractive, but also significantly transformed. Mirrored panels are so diverse, that allow to create exclusive and even subtle variations. Their color range consists of various shades of malachite, bronze, turquoise, pink and steel, and can combine several colors. The main feature of the mirrors in the room isvisual extension of the space. 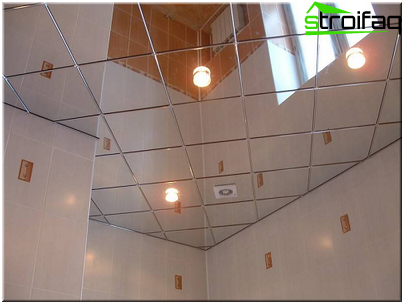 Therefore, it is mirrored ceiling can become an ideal solution for a small bathroom. It has many advantages: aesthetic, water resistance, functional, easy to install. Mirror surface ensures good light reflection, thereby increasing the illumination of the bathroom facilities, both general and local. Care for the appearance of the mirror coating is easy. To do this, apply dry and wet cleaning, using special tools for cleaning windows and mirrors. 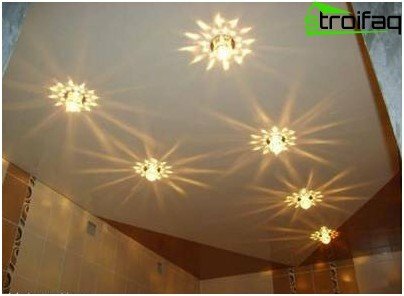 Touching on the theme of the ceiling of choice for todaybathroom, one can not forget about this modern form of the ceiling, as a glass. This beautiful and practical solution that has a number of advantages. The glass surface is not afraid of water, splash and high temperatures, can be easily cleaned from the condensate. Glass ceilings are environmentally friendly - they do not breed bacteria and mold, they do not contain toxic substances. The impact of aggressive environment is not a threat to them. Separate damaged plates can be easily replaced if necessary. Due to their optical properties, the glass enhances the visual space, and properly selected light in the room creates an atmosphere of intimacy and mystery, of airiness and lightness. For the ceiling in the bathroom can be usedglass matte or glossy, with varying degrees of transparency, also available with the use of photo printing or in the form of stained glass. We just need a little imagination and then even the small bathroom will become a great volume and an amazing view. In conclusion, we note that, no matter what kind ofceiling you choose for the bathroom in your home, most importantly, to fit all your needs. And there is no single answer to the question we asked at the beginning of the article - a ceiling is best for the bathroom? We just covered the possible and suitable types of ceilings for a bathroom. And you do not save and do not feel sorry for this magical fantasy room, and then she was for many years will be happy to meet you in the morning and in the evening to see off to sleep.